Edgar Harney elementary's new leader Ismail El-Shaakir welcomes students back after an extra-long winter break that allowed the district to take over the former charter school. Edgar Harney elementary’s new leader Ismail El-Shaakir welcomes students back after an extra-long winter break that allowed the district to take over the former charter school. 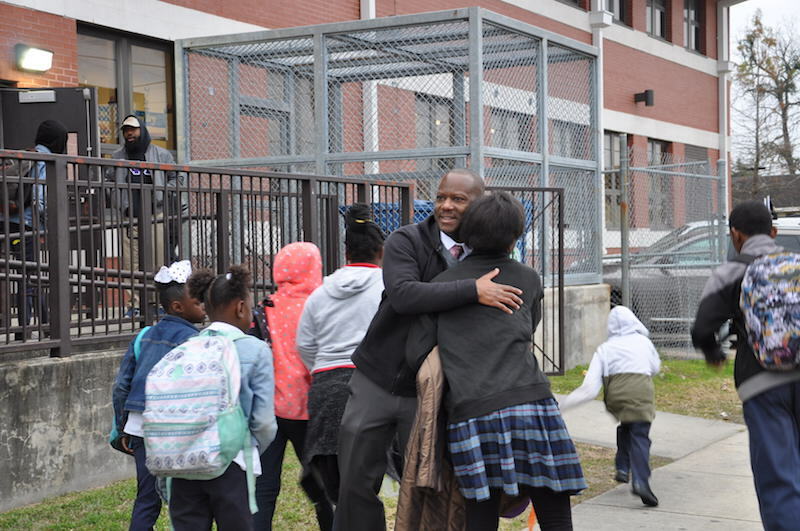 Edgar Harney elementary school students returned to school Monday, after an extra-long winter break so the Orleans Parish district could take direct control of the former charter school. The school’s new leader, Ismail El-Shaakir, stood outside to greet students with handshakes, fist bumps and hugs. El-Shaakir is the district’s school support and operations administrator. The district appointed him to lead Harney this month. He’s the sixth school leader there in two years. “Hello! How are you? It’s good to see you,” El-Shaakir said as a steady stream of Harney students entered the Central City school’s cafeteria for breakfast and a morning meeting. “Are you happy to be back?” he asked. Yes, most said. He got the one little girl who said “no” to snicker after her answer. Band teacher Kirk House, who’s back on a temporary contract with two dozen other teachers, stood outside with El-Shaakir to help answer parents questions and greet students too. “Same route, same time, same color bus,” he told a parent dropping off students. The district took control of Harney over winter break. The former charter school’s nonprofit board agreed to give up its charter contract after Superintendent Henderson Lewis Jr. initiated charter revocation proceedings in November. The charter school racked up district warnings last year, ranging from financial management concerns to potential federal special education problems. For Harney employees, that meant they had to reapply for their jobs to finish out the school year. For parents, that means a new principal and bus service company. For a portion of the school’s students, it means a new teacher or classroom. The jobs are temporary employment because the district still plans to shutter the school at the end of the school year. Lewis told the Orleans Parish School Board he would not renew the D-rated charter’s contract due to its failure to comply with state laws and school board policies. At parent meetings this fall many people lamented the loss of their community school. Dozens of the students arriving Monday morning came on foot, older siblings escorting younger ones and friends walking together. And of course, many in Saints gear, black, gold and pink, after the home team’s playoff win Sunday. Harney students will receive priority status in the district’s centralized enrollment lottery this spring.